Springfield, MO. (March 31, 2016) - After two months of renovation, the Springfield Art Museum will re-open the Musgrave Wing, containing our permanent collection exhibit “Creating an American Identity,” on Friday, April 1. Upgrades to the Musgrave Wing include all new LED lighting. The new lighting system enables us to provide brighter, clearer lighting while supporting better conditions for the continued preservation and care of our artwork. The LED bulbs emit zero ultraviolet rays, one of the primary harmful effects of our older incandescent and halogen bulbs. Additionally, these bulbs do not produce heat which also helps our delicately balanced climate control system to maintain proper temperatures in the galleries. The energy savings are another bonus. One final feature is dimmable bulbs, which allow more finite control over the light levels directed on specific, sensitive works of art. Light exposure of any kind is still harmful to art, even with LED bulbs, so our staff must maintain controls over the level of light emitted. The Musgrave Wing contains four galleries which will re-open with a number of new works from the permanent collection rotating into the exhibit, including work by artist Kara Walker who was recently featured in the travelling exhibition, “Emancipating the Past: Kara Walker’s Tales of Slavery and Power.” Also in the rotation are works by Ida Kohlmeyer, Faith Ringgold, Audrey Flack, Elizabeth Yarosz-Ash, and Anna Marie Pavlik in recognition of the conclusion of Women’s History Month. 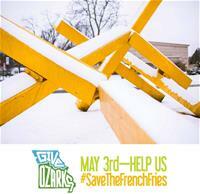 The next conservation project the Museum will work on is the #SaveTheFrenchFries Campaign. On May 3, the Museum will join over 200 other organizations participating in Give Ozarks 2016. Give Ozarks is a 24 hour online telethon-style fundraising event hosted by The Community Foundation of the Ozarks. Last year, 150 nonprofits participated and raised over $1 million for project-specific support, general operating support, or the creation of endowments. The Museum is seeking project-specific support in the amount of $17,500 for the restoration of John Henry’s Sun Target II, better known around Springfield by the moniker the “French Fries,” as well as several works by Ernest Trova on the Museum grounds. Sun Target II was acquired by the Museum in 1980 with assistance from the Missouri Arts Council and the Ola E. McAdoo bequest. It has since become a defining piece of Springfield’s cultural landscape and its local identity. After three decades of outdoor public display, the iconic work is in need of both preservation and conservation work by art handling experts. Mr. Henry was consulted on and approved the plan to restore Sun Target II. Proper stewardship of this important sculpture will ensure that it can be enjoyed for another three decades, and beyond. Give Ozarks utilizes the online platform Cause Momentum to manage fundraising campaigns. The Museum successfully used this platform in 2013 to acquire the Portrait of Lewis Allen Dicken "LAD" Crenshaw by George Caleb Bingham. That project exceeded not only fundraising goals, but friend-raising expectations. We anticipate another successful campaign given the community building aspects of the project and the generosity of southwest Missouri’s philanthropic community. Tag your memories, photos, and selfies with Sun Target II on social media with #SaveTheFrenchFries to help us raise awareness. See “Creating an American Identity” beginning April 1 at the Springfield Art Museum, located at 1111 E. Brookside Drive. Admission is always free.